RiverLaurel is a vacation property owned by Roger and Janey Wilmoth of Cincinnati, Ohio. RiverLaurel is located near Elkins, WV on the shore of the sometimes wild and always scenic Shaver’s Fork of Cheat River on 1000 feet of riverfront that is absolutely private and serene, accessible only by a private lane. The address is 114A Faulkner Rd, (county highway 5/12), Elkins, WV 26241. In the summer, RiverLaurel offers unexcelled opportunities for mountain-related recreation, including fishing on the Shaver’s Fork or in the remote streams of the nearby Monongahela National Forest (which is five minutes away), fairly-mild whitewater tubing on the Shaver’s Fork, hiking the many miles of mountain trails in the Monongahela National Forest, sightseeing in the nearby natural attractions of Blackwater Falls, Spruce Knob, Dolly Sods, Canaan Valley State Park (superb golfing), Bickle’s Knob, Douglas Falls, High Falls of Cheat, WV Game Farm, Bowden Fish Hatchery, Smoke Hole Caverns, and Seneca Caverns (all of which are in a 50-mile radius of RiverLaurel). Or simply enjoy nature and watch wildlife either at RiverLaurel or anywhere in the Monongahela National Forest. Similarly, enjoy the scenery from the Durbin and Greenbrier Valley Railway, which offers scenic train rides out of Elkins (seven miles away) or the nearby Cass Scenic Railroad. Visits to nearby historic Elkins and to it’s Davis and Elkins College are always enjoyable. Elkins is the host city to the Mountain State forest Festival and to the Augusta Festival. Nearby Buckhannon hosts the Strawberry Festival and West virginia Wesleyan College. Nearby Philippi hosts Alderson-Broaddus College. In winter, in addition to hunting, RiverLaurel offers nearby downhill skiing and snowboarding opportunities at Canaan Valley and Timberline, cross-country skiing at Canaan Valley State Park and Whitegrass (all 30-minutes away) and all of these plus snowmobiling at Snowshoe (60-min away). Or simply enjoy the peacefulness of mountain snows at RiverLaurel. RiverLaurel was built by Carl and Dorothy Wilmoth in the 1950’s and has continuously and progressively been remodeled and enlarged; beginning in 2001 by Roger, a surviving son , and his wife Janey. RiverLaurel offers three and ½ bedrooms, one and ½ baths, full kitchen facilities, laundry, a great room and dining area with gas fireplace and skylights and extensive windows overlooking the river. For those so inclined, RiverLaurel offers connectivity of cable TV, DirectTV, surround sound, DVD, and high-speed wireless internet access or offers the serenity of solitude and privacy. 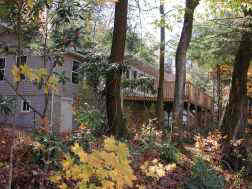 The spacious deck is adjacent to and overlooks the river and offers a comfortable hot tub and gas grill. The facility is also handicap accessible with a wide deck ramp and wide doorways. RiverLaurel receives full-time visits from red squirrels, flying squirrels, chipmunks, and racoons, and part-time visits from a variety of birds, including screech owls, hawks, crows, cardinals, nuthatches, wren,juncos, tufted titmouse, bats, blue jays, finches, chickadees, blue herons, and last but far from least, bald eagles. Don't forget the infrequent sighting of foxes, deer, and bear...and sometimes hearing bobcats. You won't see all of these on your first visit, but the more you come, the better your chances are! If you want to see more animals, It is a one-hour drive to the West Virginia Game Farm at French Creek (which is awesome). Janey and I recommend leaving the TV off and enjoying the nature and serenity afforded by RiverLaurel. We do! Please remember; RiverLaurel is a NON-SMOKING facility. For rental, contact Janey Wilmoth by email, (janeywilmoth@msn.com), Janey's cell phone 513-300-3135 or Roger's cell phone 513-226-4488 or Roger's email (roger_wilmoth@msn.com). Send mail to roger_wilmoth@msn.com with questions or comments about this web site.